A former railway corridor, the Atlanta Beltline is now one of the best examples of sustainable redevelopment in an urban setting. Although it’s still a work in progress, plenty of people have already enjoyed sun-lit strolls down the Eastside trail. Here are some things you should know about the Atlanta Beltline. Built on an old railway corridor, the Atlanta Beltline was once considered an ambitious project. Upon completion, the Atlanta Beltline is expected to connect 45 neighborhoods within the city through trails, streetcars, and parks, all within a 22-mile loop based on the former railway corridor. That’s approximately 22 miles of modern streetcar, 2,000 acres of parks, and 33 miles of multi-use trail, making it one of the largest urban redevelopment programs in the country. Opened four multi-use trails and seven parks to the public. Built affordable homes for the workforce. Created an arboretum and urban farm. Hosted the largest public art exhibit in the region. There are currently two trails being constructed, and plans for the streetcar expansion are well underway. For now, the Beltline’s open sections are as follows: Northside Trail, West End Trail, Southwest Connector Spur Trail, Gordon White Park, Perkerson Park, H. Stanton Park, Boulevard Crossing Park, Arthur Langford, Jr. Skatepark, Eastside Trail, Historic Fourth Ward Park, Historic Fourth Ward Skatepark, and several interim hiking trails. The Atlanta Beltline gives city residents a new, sustainable avenue for outdoor recreation within the city. 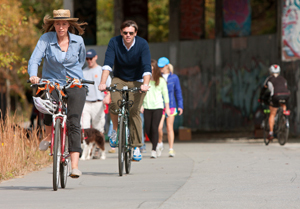 In addition, the Atlanta Beltline also hosts several events throughout the year. Don’t miss out on the following activities. Free fitness classes – The Atlanta Beltline is the location of a wide range of free fitness classes, so take your friends and family with you. Classes offered range from aerobics to hiking and even basic mountain biking. For a full list of classes offered and more information on class schedules and registration, check out this link. Run.Walk.Go! Race Series – Explore the Atlanta Beltline’s different trail segments by participating in one of the events of the Run.Walk.Go! Race Series. This year, the race series will feature two events: the Westside 5K (July) and the Eastside 10K. For more information, click this link. Joining any of the races are also a great way of testing your endurance and stamina. Special events – The Atlanta Beltline also hosts an array of events, from formal and private functions to public affairs, like the Old Fourth Ward Fall Fest and Art on the Atlanta Beltline. The Fall Fest is a two-day celebration that features live music entertainment, workshops, and food. Meanwhile, Art on the Atlanta Beltline is a celebrated visual art and performance exhibition, always opened by a colorful Lantern Parade each year. For more information about the special events at the Atlanta Beltline, head over to this link. Live life in one of the best cities in the country. To explore your real estate opportunities in Atlanta, get in touch with me today at 404-550-5113 or Natalie(dotted)Gregory(at)Compass(dotted)com.